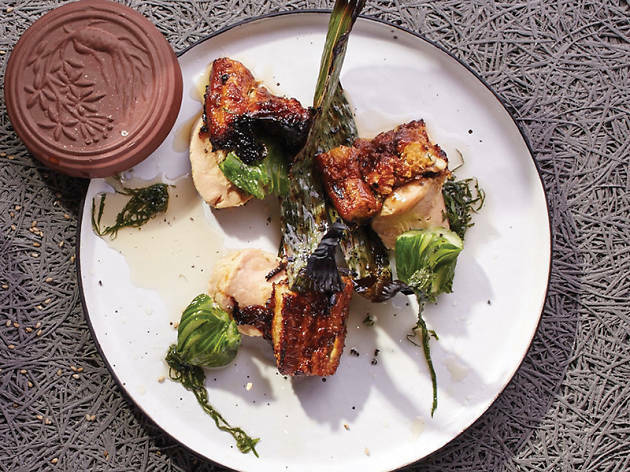 There are many avenues to success in Hong Kong’s dynamic culinary scene. There’s star power, either Michelin stars or a celebrity chef who fronts the restaurant. There’re traditionalists, those eateries famous for sticking to the classics and refining their preparation and presentation to perfection. And then there’s the maverick approach the brainchild of a chef who’s travelled the world picking up inspiration and wants to showcase his/her prowess with an original concept. Sometimes these ventures succeed – Yardbird, Upper Modern Bistro, Duddell’s and Little Bao – but often they fall by the wayside. Okra is of the latter approach. An original concept restaurant near the Sai Ying Pun MTR exit on Queen’s Road West, it’s opened to a slew of Instagram buzz, but can it succeed where so many others have failed? The entrance is a beautiful mosaic patterned on the cross-section of an okra plant. The inside space is a narrow corridor with bar seats facing an open kitchen where the chef serves counter-side.We’re no longer enamoured with Okra’s done-to-death shared plates concept, but the idea has introduced some tasty – albeit pricey – bites to our town, so we leave our prejudice at the door. Classing themselves as ‘Japanese reinvented’, our host for the evening, Daniel Garner, has been a chef at Nobu outposts around the world. If you want someone who knows how to push the limits of Japanese cuisine, it doesn’t get much better than a Nobu alumni. The menu is separated into A-sides for smaller bites and B-sides for larger ones, and there is an extensive sake list featuring micro-distilleries dotted all over Japan. We choose carabinero prawn soup ($78) and bafuni and smoked anchovies ($160) from the A-sides to begin our meal. The red Spanish prawns are served in a bowl with hot dashi infused with smoked Buddha’s hand poured over the shellfish. We love the fresh, sweet taste of the prawns, but the broth takes our breath away. It quickly absorbs the strong flavours of the seafood while the dashi does its job as a conduit to the light blossoming of the citrus tones of the Buddha’s hand. A strong start. Bafuni is a colloquial phonetisation of the premium bafun uni from the coasts of Hokkaido, and when combined with something as foreign as anchovies it piques our interest. Surprisingly, these two ingredients work well together, especially with the Buddha’s hand – back again – acting as the usher that directs the sweetness of the uni away to make room for the steely flavours of the fish. Moving on to the more substantial B-sides, we start with a kanzuri pastrami ($228), where slices of pastrami are immersed in plum dashi accompanied with tightly rolled charred cabbage. The beef is tender and the tangy dashi cuts some of the meat’s heaviness, but the star is the cabbage, which carries a slight whiff of kanzuri chilli powder and has consumed the best of the pastrami stock. Unfortunately, the high is short-lived. We look forward to the dry-aged baby tuna ($98) as it conjures expectations of tender, flavourful fish. When the dish arrives, it’s crispy fried and artfully cooked with a ruby red rare centre. When we sink our teeth into the fish, however, our upper palates are attacked by shards of bone and this assault continues with every single piece we bite into. It’s a complete waste of good tuna and a standard unacceptable to anywhere claiming some sort of Japanese influence. Even the innovative plum ketchup, which balances the fried batter expertly, can’t save this disaster. Fortunately, the evening is somewhat redeemed by the last course, unakyu foie gras ($238). 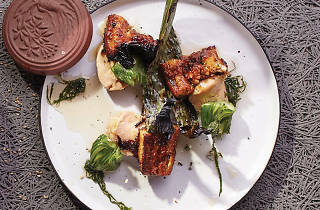 Comprising a home-made unagi topped with honey-infused duck liver and doused with a toothsome sanbaizu sauce, we’re excited such common ingredients from opposite ends of the planet can combine so well. The disaster with the tuna leaves us sore both in a literal and metaphorical sense. Yet the creativity and exceptional flavours elsewhere trump that singular failing. It takes a lot to muster the courage to attempt something new in a city of picky palates. De-bone your fish, guys, because something like that can make or break you in Hong Kong.